Wedding PR: Social Tables, Huffington Post and more! We’re so excited to share another week of fabulous client features, from Social Tables to Huffington Post and so much more! Be sure to check it all out below! 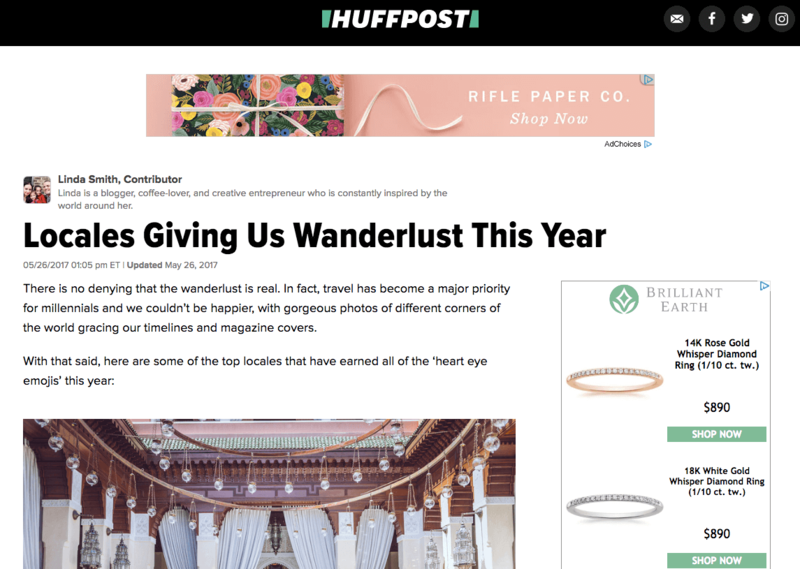 Cocoon Events Management Group, Destination Weddings Travel Group, Rochelle Cheever Photography, Wente Vineyards, International Academy of Wedding & Event Planning, and Belladeux Event Design were featured on Huffington Post in the article, Locales Giving Us Wanderlust This Year. See the full article here. Cocoon Events Management Group was featured on Catersource with their guest article, Adding Luxury Details to Your Event. See the full article here. OFD Consulting was featured on Social Tables with her guest article, How to Leverage Content Marketing, Not Gimmicks, to Promote Your Event Company. See the full article here. Fantasy Sound Event Services was featured on Timeline Genius with their guest article, How to Increase Productivity with These Simple Tricks. See the full article here. Cocoon Events Management Group was featured on Timeline Genius with the guest article, Preemptively Meeting Client Expectations. See the full article here. 100 Candles was featured on Social Tables with their guest article, Should Your Event Business Work With a Wholesaler? 5 Questions to Ask. See the full article here. OFD Consulting was featured on Timeline Genius with her guest article, The First 5 Steps to Creating a Killer PR Plan. See the full article here. Fantasy Sound Event Services was featured on Social Tables with their guest article, Best Practices for Managing Time in Your Hotel Sales Cycle. See the full article here. Belladeux Event Design was featured on Social Tables with her guest article, 4 Ways to Stay Ahead of Outdoor Event Decor Trends. See the full article here. OFD Consulting, Where Will They Stay?, 100 Candles, Color Pop Events, Belladeux Event Design, Nahid’s Global Events, Be Photography, Kaysha Weiner Photographer, Stephanie Yonce Photography, Fantasy Sound Event Services, Don Mears Photography and Destination Weddings Travel Group were featured on So This is Love in the guest article, Top Ten Things to Consider for Your Wedding Day. See the full feature here.